Provide your workforce with the content and tools they need to connect and communicate with those inside and outside your company. 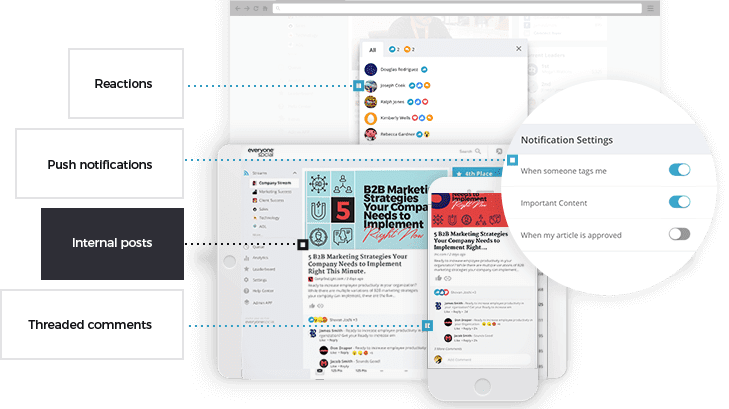 See why EveryoneSocial is the platform preferred by communications teams tasked with making their organizations more connected, mobile, and engaged. User engagement is what drives a successful program. It’s no one job to participate, they have to want to. EveryoneSocial users are more engaged than those on any other platform, period. We partner with every one of our customers to ensure success and it’s one of the things we’re known for. It’s not something we charge for because we believe it’s too important. 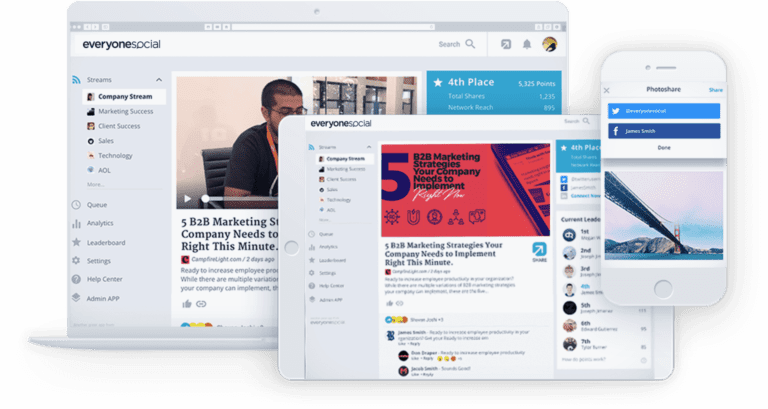 EveryoneSocial makes it exceedingly simple to aggregate, review, approve and push content out to your people via the web, mobile, and email. These tools are available to admins via our web and mobile apps. 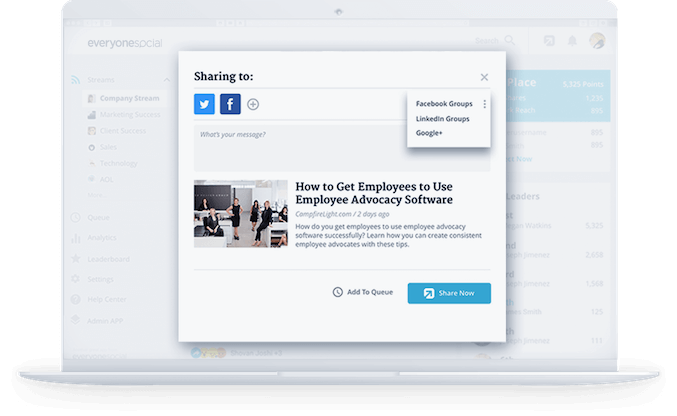 EveryoneSocial makes it easy for your people to share your company’s content to their networks. With a couple clicks and a few minutes of their time each week they can be actively sharing and engaging. We know mobile is critical for Communications. EveryoneSocial is 100% mobile first and the majority of all our users access the platform through our native iOS and Android apps. No matter if you have 50 or 50,000 people on EveryoneSocial, you need to know what they’re sharing and how that content is performing. EveryoneSocial’s reporting provides data down to the individual user and share. It’s also fully exportable. 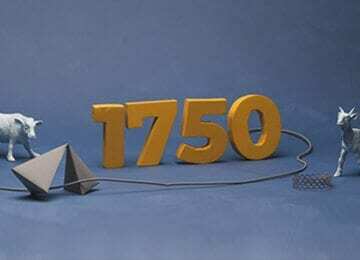 A little competition can go a long way. 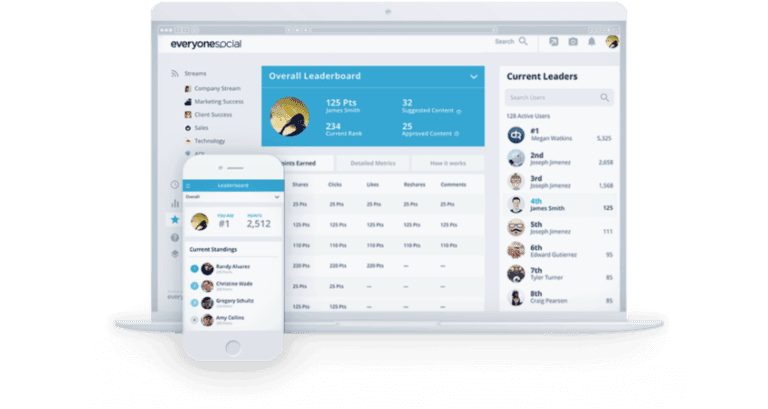 EveryoneSocial includes a bevy of simple but engaging leaderboard and gamification features to foster healthy competition and keep your people coming back for more. User-generated content generates some of the highest levels of engagement. With EveryoneSocial, your people will be able to create photos, videos, and other post types for internal and external sharing. 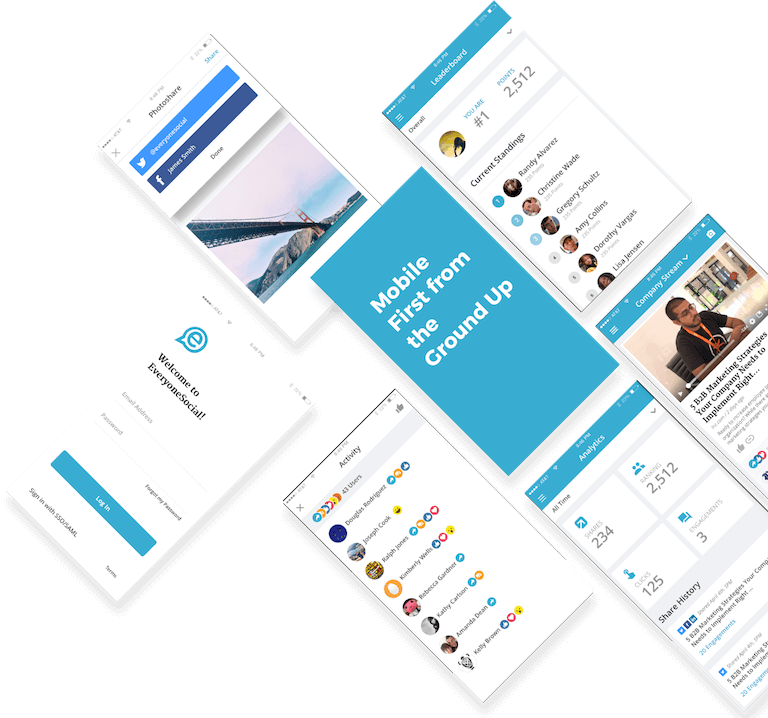 From user-generated content, to reactions (likes), threaded comments, and push notifications EveryoneSocial includes all the tools for users to engage with each other and keep the party going. As some of our customers like to say “if it isn’t in Salesforce, it doesn’t exist”. 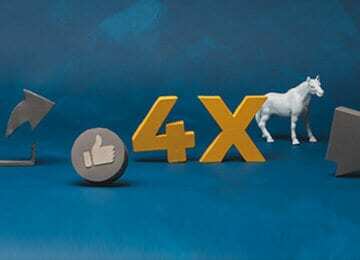 Whatever your approach, EveryoneSocial has numerous integrations with Salesforce. If you’re not already using SSO, chances are you will be real soon. EveryoneSocial is fully integrated with all of the major platforms including Okta, Azure AD, and PingOne. Employees are central to a successful, modern communications strategy. Internal or external, doesn’t matter; employees have large networks in and outside your org, and when they share content with those networks they’re able to generate more and better engagement at a far lower cost than paid media. We partner with every client for the lifetime of our relationship in order to ensure your success. We’ve worked with the best and can help guide you and your team away from pitfalls, share best practices and learnings, and connect you with peers in the industry. Every one of our clients gets matched with a dedicated member of our client success team. This is the person your team will work with pre-, during, and post-launch. 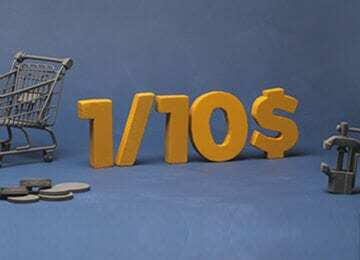 We don’t charge for this and we don’t put any limits on how much you leverage them. Your dedicated client success person will not only help you get your account up and running, they’ll lead live trainings for your admins and end users. Need refresher trainings, on-boarding new users? Not a problem. You tell us what you need and we’ll make it happen. Helping your team track the right metrics and adjust based on your business goals are the primary areas where your dedicated client success person will assist. We like to do the quarterly deep-dives in person with a member of our senior management team.